Wedding herbs have been a part of the marriage celebration for centuries, prized both for their beauty and reputed mystical powers. When the little flower girl sprinkles rose petals before the bride she is enacting the ancient practice of strewing scented herbs to freshen the house of worship as the bride enters. 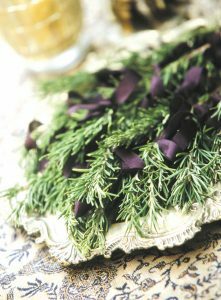 In the seventeenth century, rosemary was included in the wedding festivities as a sign of fidelity and to ensure the groom’s virility. Known as the “herb of grace”, rue was grown in a young girl’s garden, then woven into a delicate headpiece for her wedding. Some bridal favorites such as myrtle (the wedding herb) and lily of the valley still retain their age-old appeal, often carried in even the most traditional bridal bouquet. Herbal customs have always been part of the wedding celebration. Perhaps it is time to revive our knowledge of their origins and symbolism. Indeed, many brides today are returning to ancient traditions, finding new ways to use herbs in a wedding, and continuing to be charmed by the sweetness of herbal lore. Herbs add immeasurable appeal to the bride’s flowers, enhance gift-giving rituals, and of course, add flavor to the wedding feast. By using the resources at the back of the book you will have access to herbs even if local suppliers cannot satisfy your needs. Planting an herb garden may also be an option if there is sufficient time before the wedding. Many people are pleasantly surprised at how easy herbs are to grow, even for a novice gardener. Undoubtedly, the little plants will also take root in your soul, providing an irresistible and pleasant occupation. You may go all out and have an “herbal wedding”, using herbs for bouquets, centerpieces, decorations, and gifts, but adding herbs can be as simple as giving a favor of fresh rosemary (for remembrance) to each guest, or tucking a few sprigs of mint, myrtle, or sage into your bridal bouquet. By including herbs in your wedding you will be renewing a beautiful tradition with ancient connections, creating a unique and memorable celebration in the process.